This is another gem from the “Pie for Dinner” issue of Bon Appetit. and it does not disappoint! It is a bit of a time commitment, however, but worth every minute. Whether the you’re in the mood for a cheesy custardy dinner or the perfect centerpiece for brunch, then this is for you. It’s also ridiculously satisfying to eat a pie made of things your boyfriend can’t stand (or is that just me?). Remember the one from Chicken & Leek Pie? It’s the same! Pulse flour and salt in food processor to combine. Pulse in butter until mixture resembles coarse meal. Then, combine the vinegar and water in water measuring cup. Drizzle in the water and vinegar mixture while pulsing until dough just holds together. Divide the dough in half in plastic wrap and refrigerate until firm (about 2 hours). Roll out 1/2 of the dough to a 14″ round. 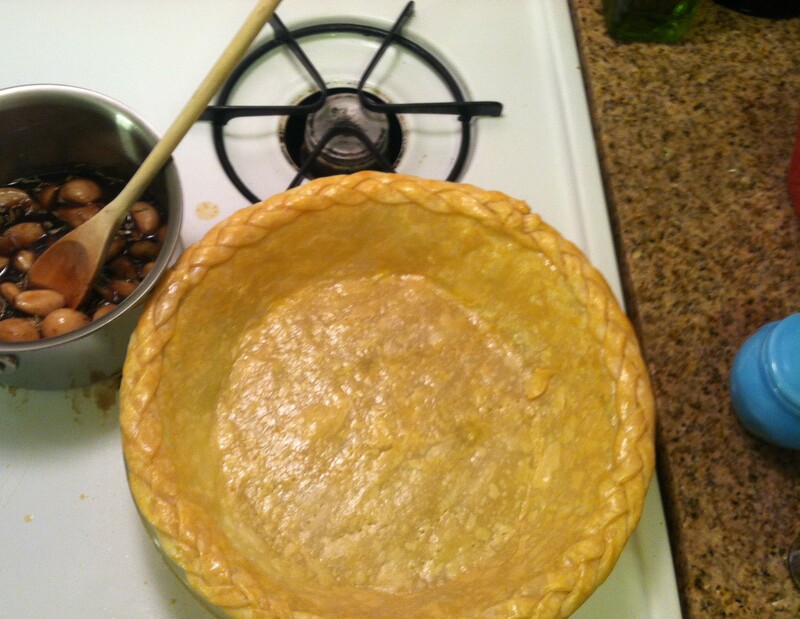 Place over 9″ pie dish, leaving 1″ overhang and freeze for 15 minutes. Roll out other 1/2 of dough to about 1/8″. 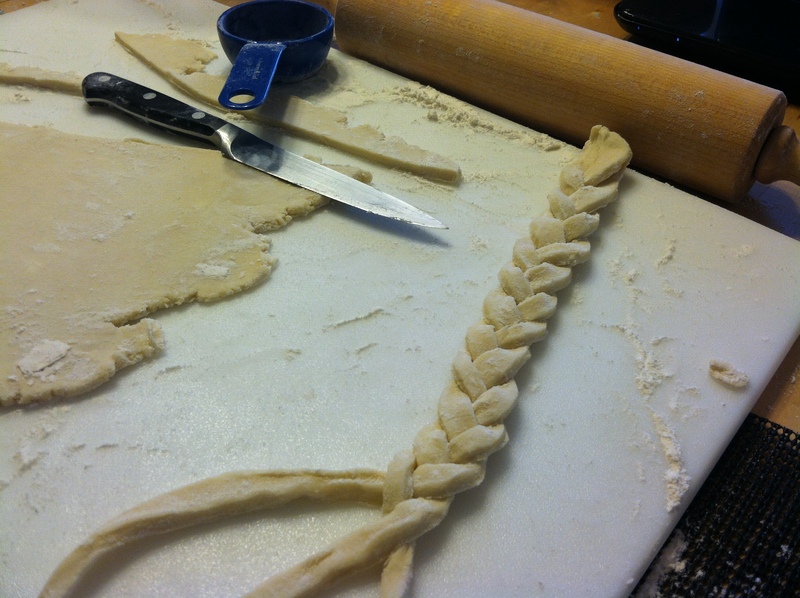 Cut into strips and braid the chilled dough (chill if dough gets too soft). Beat one egg in a small bowl. Score the edge of the pie and brush it with the egg. Brush the underside of the braid with egg and carefully place around the edge of the pie, pressing together sections are you go. Freeze for 15 minutes and preheat the oven to 350 degrees. 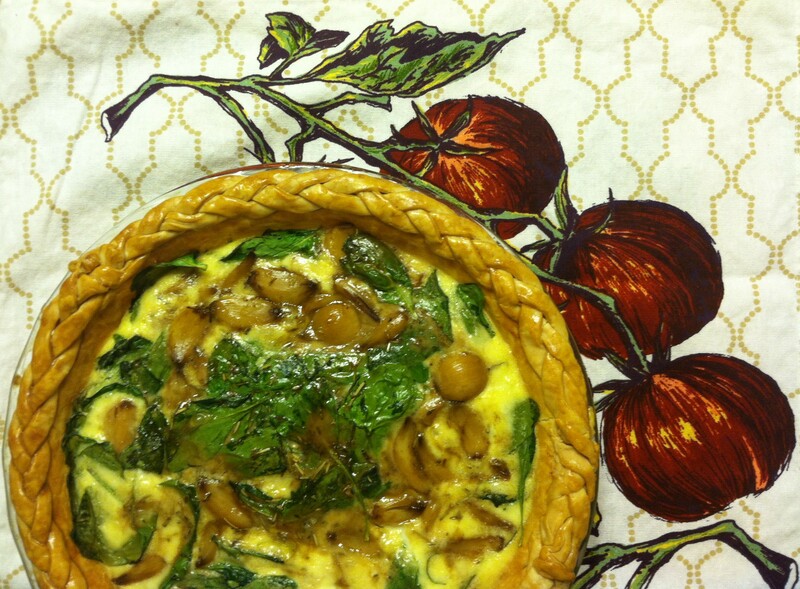 Line with foil or parchment paper and fill with pie weights or beans. Bake for 25-30 minutes until pie is dry around the edge. Remove the foil/parchment, brush with the egg and bake for another 10-15 minutes. 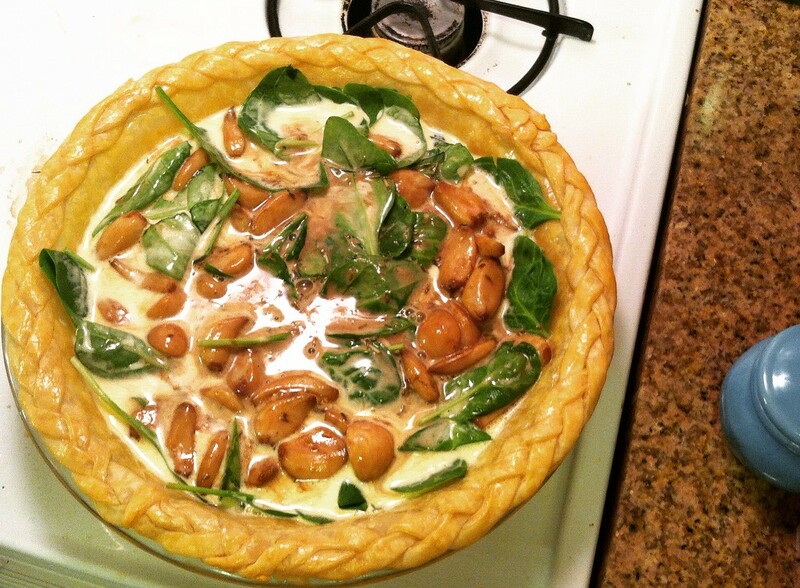 *I’m gonna be real with you…my first crust for this pie was a disaster. I must not have secured the braided section very well because it fell down inside the crust while baking. 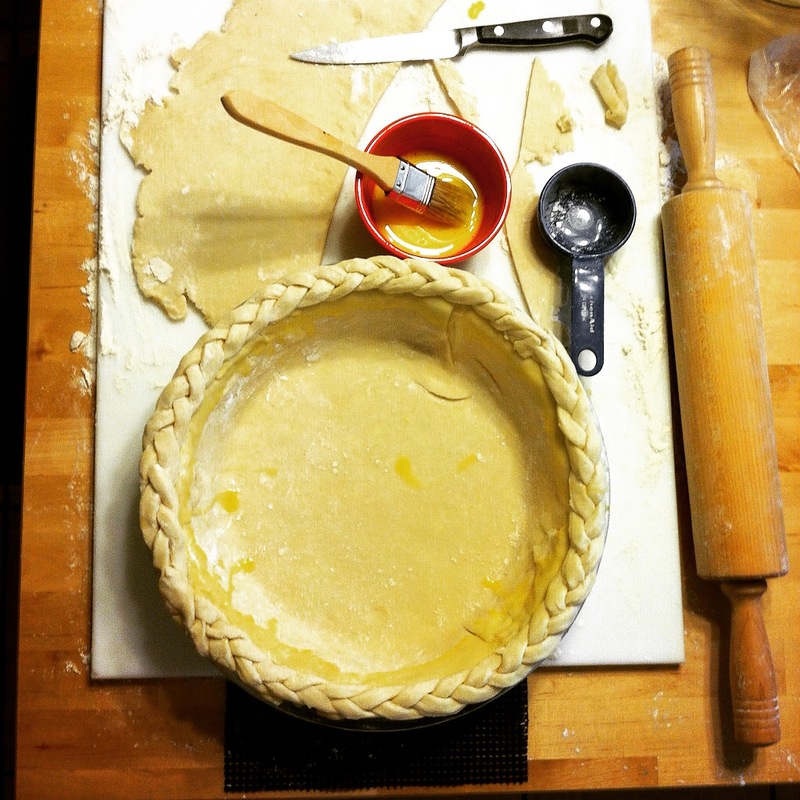 I remade the crust, scored the braids and watched it like a hawk in the oven…then all was well! 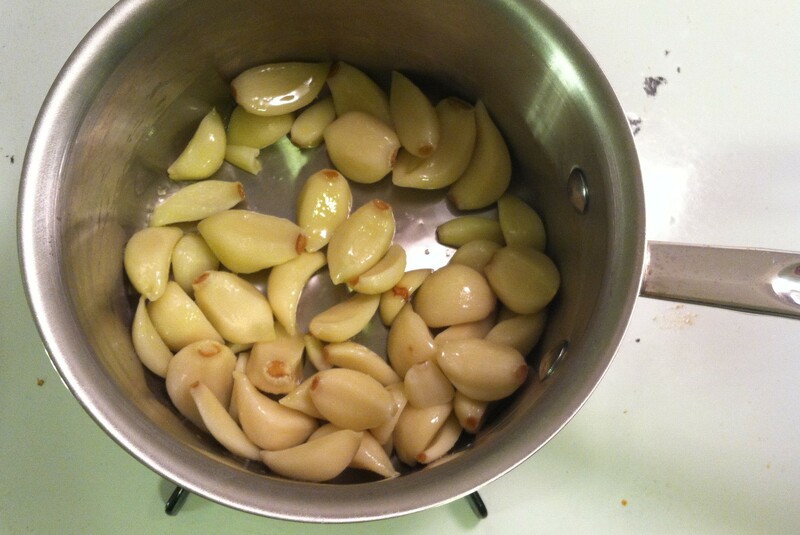 Cook garlic in a medium saucepan in salted boiling water until beginning to soften, about 3 minutes. Drain, wipe the saucepan dry, and heat the oil over medium high heat. Cook the garlic until the cloves start to turn golden brown. Add vinegar and one cup water and bring to a boil. 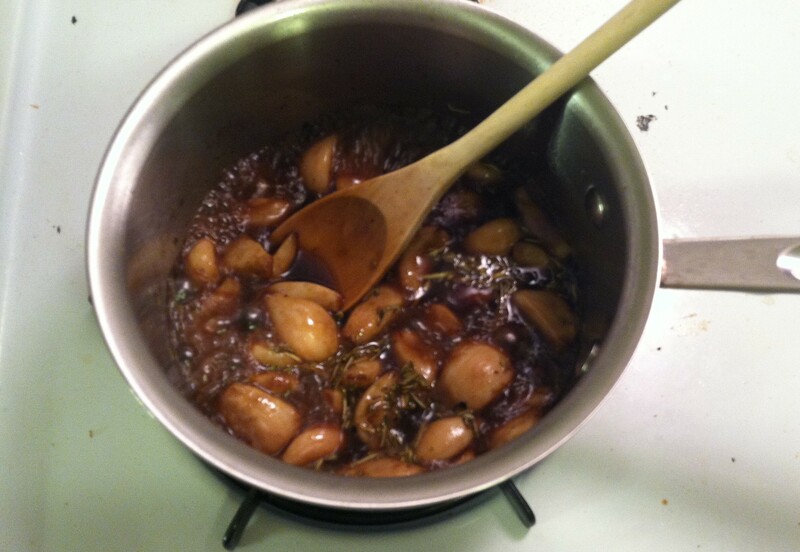 Reduce the heat and simmer until garlic is tender, about 10-12 minutes. Preheat oven to 350 degrees, add the maple syrup, rosemary and thyme, to the garlic then season with salt and pepper. Cook, stirring occasionally until liquid is syrupy and coats the garlic, about 5 minutes. 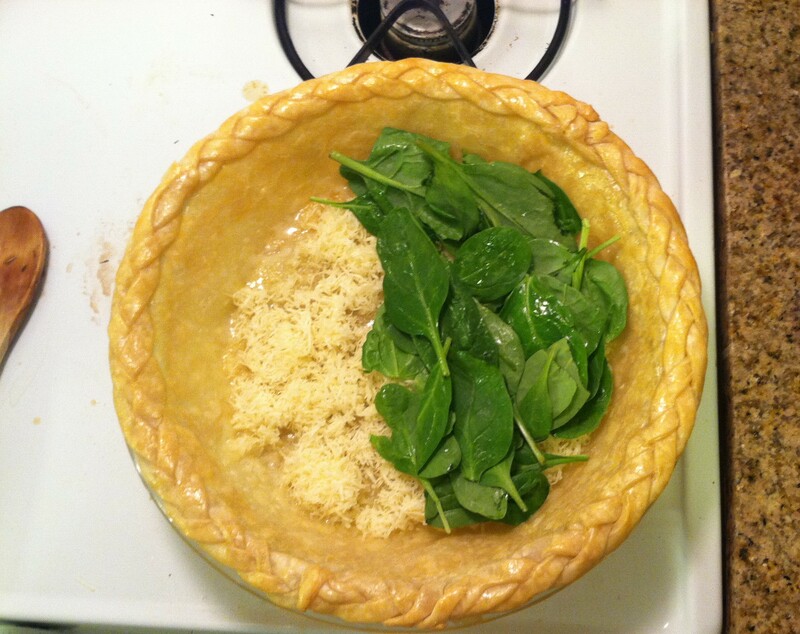 Scatter cheese over the crust and top with spinach. Whisk crème fraiche, cream and remaining 4 eggs together in a bowl, season with salt and pepper and pour over the spinach. Add garlic and any syrup. Bake until custard is set and golden (about 45-55 minutes).